Do you want to know where do your commenter came from? If you are using WordPress just proceed with the Comment Tab and check his IP. Insert it here and presto it will provide you the location. 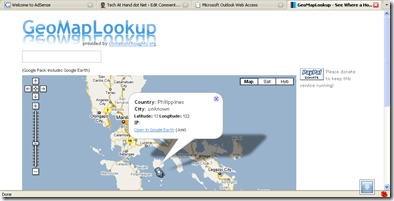 Enter an IP address or hostname to lookup its geolocation. Defaults to your current IP. You can also pass an IP or hostname by adding ?ip=<IP-TO-USE> as a suffix to the page URL. This is a great way to provide more information to the users of your own applications like a CMS or blogging tool!